Born and raised on a council estate in Battersea, Tom may not come from a traditional farming background, but he certainly has the passion, knowledge and experience. He decided he wanted to be a farmer at just 8, inspired by a visit to a city farm. After college, at the age of 18, Tom joined us here at Mudchute, moving over from the cross bred commercial livestock to our native rare breeds. Tom has since been the farm manager at a farm for children with behavioural difficulties in Essex and at Vauxhall City Farm, managed the farm park at Hatfield house and most recently an instructor at Capel Manor College. His passion for rare breeds has continued throughout his career, and he is currently the education representative of the British Waterfowl Association and a trustee of the Rare Breeds Survival Trust. 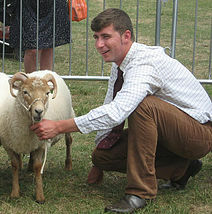 Tom also judges sheep, poultry and waterfowl at agricultural shows. You may have even spotted him employing his ovine expertise recently on ITV’s Go For It. Tom is delighted to be back with us at Mudchute, bringing his enthusiasm for native breeds and sharing these incredible animals with our visitors. He’s also happy to be back in the city farm environment which first inspired him. We hope you’ll join us in welcoming him back to the farm!